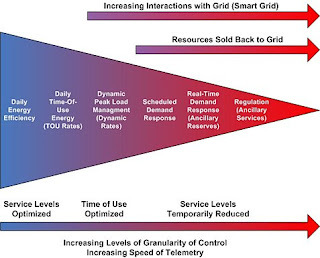 Utilities and ISOs nationwide have a large variety of demand response programs that implement different goals, but there is not yet a standard that covers all the variations of information elements across the spectrum of DR programs, or a standard for communicating that information. Demand response is as a priority area because of its important role in maintaining grid stability as the grid is operated closer to capacity, and as more renewables are brought online with their less stable generation characteristics. DR is key to changing load shape and reducing the need for peaking generation plants. Utilities and ISOs nationwide have a large variety of proprietary programs that implement different DR goals. There is not yet a standard that covers all the variations of information elements across the spectrum of DR programs, or a standard for communicating that information. OpenHAN - (Wikipedia) - Defines a set of common requirements for Home Area Networks (HANs) intended to be used by utilities. It is led by utilities and aimed at the residential space. It was developed under the Open Smart Grid (OpenSG) Subcommittee of the Utility Communication Architecture (UCA) International Users Group (UCAIug). The specification covers the energy services interface which provides security and coordination functions that enable secure interactions between relevant home area network (HAN) devices and the utility. It permits applications such as remote load control, monitoring and control of distributed generation, in-home display of customer usage, reading of non-energy meters, and integration with building management systems. It also provides auditing/logging functions that record transactions to and from HAN Devices. In the openHAN architecture, "The display portion is remote from the measurement, communicating with the sensor using a cable, power line communications, or using radio. Online displays are also available which allow the user to display near real-time consumption on any device that can connect to the Internet. These displays can reduce household energy consumption by providing real-time feedback to homeowners so they can change their energy using behavior. 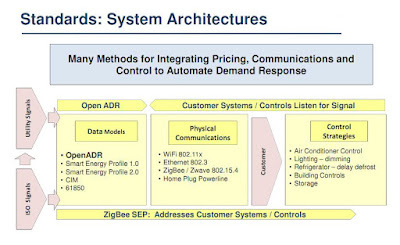 OpenADR - Open Automated Demand Response - A web-services based communications data model designed to facilitate sending and receiving of DR signals from a Utility or independent system operator (ISO) to electric customers. It is designed to serve larger commercial and industrial customers. The intention of the data model is to interact with building and industrial control systems that are pre-programmed to take action based on a DR signal, enabling a demand response event to be fully automated, with no manual intervention. It has a highly flexible infrastructure design to facilitate common information exchange between Utility/ISO and end-use participants. OpenADR – A web-services based communications data model designed to facilitate sending and receiving of DR signals from a Utility or independent system operator (ISO) to electric customers. Developed at the Demand Response Research Center managed by Lawrence Berkeley National Laboratory with funding from the California Energy Commission (CEC) Public Interest Energy Research (PIER) program, in collaboration with California Investor Owned Utilities. The intention of the data model is to interact with building and industrial control systems that are pre- programmed to take action based on a DR signal, enabling a demand response event to be fully automated, with no manual intervention. It has a highly flexible infrastructure design to facilitate common information exchange between Utility/ISO and end-use participants. The first version, OpenADR 1.0, was developed at Lawrence Berkeley National Lab. OpenADR 2.0 is being completed by the Organization for the Advancement of Structured Information Standards, or OASIS. The second version will ensure interoperability between different software products and the utility’s back end. OpenHAN - These specifications allow the customer and vendor communities to communicate with each other through a common document and to understand the complexities of what is needed to meet business objectives. These de facto specifications and requirements are also written in a manner that facilitates work by formal standards groups to develop de jure standards. Developed under the OpenSG Subcommittee of the UCAIUG, is a specification that covers the energy services interface which provides security and coordination functions that enable secure interactions between relevant HAN devices and the utility. It permits applications such as remote load control, monitoring and control of distributed generation, in-home display of customer usage, reading of non-energy meters, and integration with building management systems. It also provides auditing/logging functions that record transactions to and from HAN Devices. PowerTalk - Software from EnerNOC that brings "presence" to the air conditioners, motors, light banks and other devices that it pledges to turn down on demand to help utilities get through peak loads. Until now, that meant building a virtual private network at each customer's site. It also meant that every device must be asked how it's doing, so to speak -- it doesn't let you know unless you ask. PowerTalk fixes that by hooking up every device with the equivalent of an instant message service, using Extensible Messaging and Presence Protocol (XMPP), an open instant messaging standard. 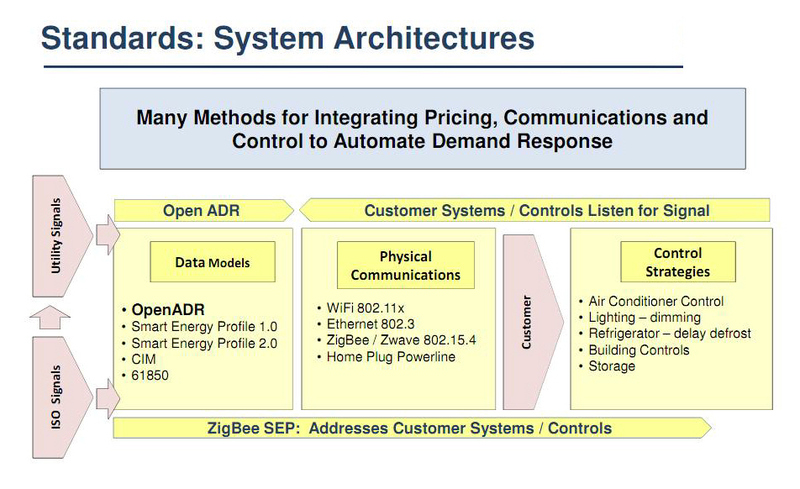 But EnerNoc has asked NIST to consider XMPP for inclusion as an automated demand response standard as well. EnerNOC claims that XMPP could offer some advantages in speed over the OpenADR system. 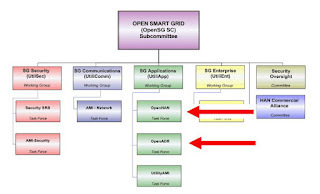 UCAIug - Utility Communication Architecture (UCA) International Users Group - It’s Open Smart Grid (OpenSG) Subcommittee developed OpenHAN. NIST has recognized OpenADR and OpenHAN in initial list of 16 Smart Grid standards. The next step in the OpenHAN process will be a common information model that could be carried over a variety of networking technologies. Second was the swift creation of the “Smart Energy” profile, an object model dedicated to electric utility functions, by the ZigBee Alliance. Top of the list is price communication and DR signaling. There is a need for harmonization of information models with Zigbee SEP and IEC 61850 and ANSI C12.19 on pricing and DR signals. Define OpenADR Collaborative’s role to include addressing some of the challenges. OpenADR Facilitates implementation + Reduces cost of technology = greater customer participation. Achieve a 50 % adoption rate of all commercial and industrial users in 5 yrs– installed base. Most major manufacturers make control systems that can use OpenADR signals. Most major utilities & ISO’s offer Dynamic Prices and Reliability Signals using OpenADR. All new commercial buildings and facilities are equipped with OpenADR compliant systems. A study using the PowerCost Monitor (which utilizes an OpenHAN architecture) deployed in 500 Ontario homes by Hydro One showed an average 6.5% drop in total electricity use when compared with a similarly sized control group. Common Pricing Model Standard - The need for a common pricing model crosses all domains that use price. Price is more than a simple number; it carries market context, and information such as quantity, units, time for use, and characteristics including source type and potentially carbon characteristics. A common and interoperable pricing model is a key to Demand-Response systems. Complex Tariff Structures and Content - To fully understand a price one needs to fully understand thousands of pages of tariffs for each jurisdiction. Driving toward simplified tariffs or (at minimum) machine-readable descriptions of tariffs would lead to more efficient markets. Lack of Standards for the DR signals to DER devices. - There are competing standards and specifications that include OpenADR, NAESB, and others. A common standard for communicating to both load control and supply control devices will help accelerate DR implementations at the utilities and DER device manufacturing with products. Too Many HAN Standards - In attempting to deploy Smart Grid applications such as AMI and DR to the home, utilities have necessarily entered the volatile home and building automation markets. These industries have implemented a huge variety of networking technologies, both open and proprietary, wired and wireless. The leaders in this area include BACnet, HomePlug 6LowPAN and ZigBee, plus semi-proprietary solutions like LONtalk, Insteon, and Z-Wave; more traditional (but costly and power-hungry) open standards like Ethernet and Wi-Fi; and popular legacy protocols such as X10. Such diversity and lack of interoperability has presented difficulties to the vendors in these markets previously, but the problem has been exacerbated by the deployment of AMI and other Smart Grid applications. Utilities would prefer to implement a single networking technology across every premise in their service area, a possibility that was previously very unlikely in this market. Immaturity - Any standards effort takes time. Utilities that must deploy customer-oriented Smart Grid applications right now are being forced to either commit to a particular technology, provide services only to customers who already have Internet access, or defer applications that require the use of a HAN until some future release. In the latter case, they may be faced with higher upgrade costs later. In August 2011, OpenADR Alliance announced it has selected Intertek as its exclusive testing and certification laboratory, providing conformance testing and certification for OpenADR 2.0 compliant products for interoperability with the smart grid. The Alliance is in the process of developing and standardizing OpenADR 2.0 version of the standard and has engaged Intertek to be the only, independent third-party testing company that will perform interoperability testing and certification, for OpenADR 2.0 compliant products. OpenHAN should move to a formal SDO process and alignment with OpenADR may be more easily supported if OpenHAN is moved to OASIS. Both efforts are encouraged to work closely with stakeholders and NIST on definitions of customer interfaces. Another promising sign is the agreement between the ZigBee Alliance and HomePlug PowerLine Alliance to develop a common application layer across their respective wireless and broadband-over-power line technologies. All these efforts are being coordinated though the UtilityAMI organization. The U.S. Green Building Council is looking into offering demand response credits for LEED-certified buildings, with the idea to have OpenADR-based programs approved for those credits. More than 60 companies have already built products using OpenADR and more will come once a standard is finalized within 2011. Implement rates that reflect true cost of energy – incentive to manage usage. DRRC - Demand Response Research Center, Berkeley, CA - Managing by Lawrence Berkeley Lab. Established in 2004 by the California Energy Commission Public Interest Energy research (PIER) program to conduct research that advances the near-term adoption of demand response (DR) technologies, policies, programs, strategies and practices. DRRC developed the first version of the ADR Standard. DRSG - Demand Response and Smart Grid Coalition - DRSG is the trade association for companies providing technologies, products and services in the demand response and smart grid areas. Members of the DRSG Coalition include: Aclara, Advanced Telemetry, Ambient, Amplex, Bridge Energy Group, CalAmp, Comverge, Conservation Services Group, Corporate Systems Engineering, CPower, Direct Energy, Echelon, Eka Systems, eMeter, Energy Capital Partners, Energy Curtailment Specialists, EnergySolve, EnerNOC, Enfora, Enspiria Solutions, GE, Google, Honeywell, IBM, Ice Energy, Itron, KMC Controls, Landis+Gyr, Lutron Electronics, Oracle, PCN Technology, Sensus, Silver Spring Networks, SmartSynch (now Itron Celluar Solutions), Space-Time Insight, Steffes, Tendril, Trilliant Networks, Universal Powerline Association, Whirlpool, ZigBee Alliance, and Ziphany. NERC - The North American Electric Reliability Council - Has worked with all stakeholders over the past several years to revise its Policies into Standards, and now has authority to enforce those standards on power system entities operating in the United States, as well as several provinces in Canada, by way of significant financial penalties for noncompliance. NIST - National Institute of Standards and Technology - In 2007, Congress declared in the Energy Independence Act (EISA) that modernizing the grid is national policy. EISA requires the NIST to develop a consensus on the standards and protocols necessary to ensure Smart Grid functionality and interoperability. OpenADR Alliance - Formed in October 2010 and comprised of industry stakeholders that are interested in fostering the deployment of low-cost price- and reliability-based demand response communication protocol by facilitating and accelerating the development and adoption of OpenADR standards and compliance with those standards. These include de facto standards based on specifications published by LBNL in April 2009, as well as Smart Grid-related standards emerging from OASIS, UCA and NAESB. Utility Integration Solutions (UISOL), Layfayette, CA, Acquired by Alstom in March 2011. UISOL develops and commercializes DRBizNet™, a leading software platform for demand response management, and is among the leading utility systems integration specialists. The company, which employs 44 employees, generated in 2010 total sales of over $11 million. UISOL is supporting DRRC at Berkeley Lab on OpenADR, primarily in deployment of the OpenADR standards and development of Open Source toolkit for wide-scale adoption of OpenADR. This acquisition has positive implications for technology developed by Berkeley Lab and its research partners in mainstreaming the OpenADR technology to the national and international markets. UISOL has two main activities. The first is as a technology consultant for utilities and public authorities, in particular for the integration of distributed energy resources. The second is to develop and commercialize software platforms – and supporting services – which mainly cover demand response, integration of renewable energies, energy storage – such as electrical batteries - and charging points for electric vehicles. In November 2009, UISOL announced an agreement with the U.S. Department of Energy's Lawrence Berkeley National Laboratory (Berkeley Labs) to develop the Open Automated Demand Response (OpenADR) specification into an open source platform for use in Smart Grid applications. The joint project with UISOL was administered by its Environmental Energy Technology and Computing Research divisions. The California Energy Commission and UISOL co-funded the project. The project was intended to transition OpenADR from its published specification version 1.0 status to an open source implementation that can be offered in the public domain for further research, development and distribution in the utility, controls and buildings industries. UISOL built an example client and server of the published OpenADR specification version 1.0 and conduct demonstration and simulation testing from Dec. 2009 through March 2010. Upon completion, UISOL delivered a toolkit that includes an executable Microsoft Windows-based server and client, source code that can be compiled by third parties, and user documentation.